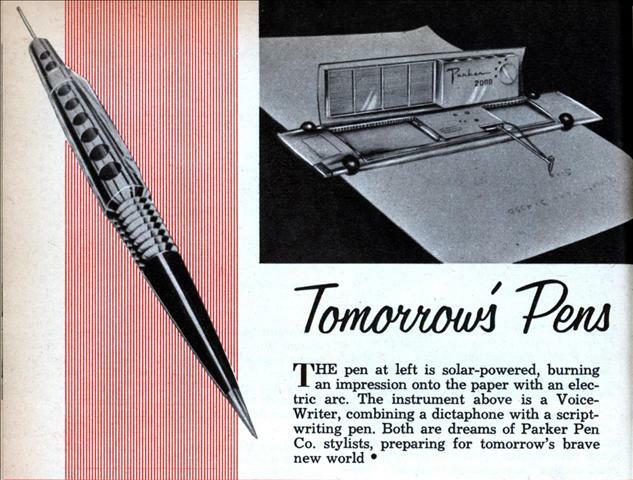 THE pen at left is solar-powered, burning an impression onto the paper with an electric arc. The instrument above is a Voice-Writer, combining a dictaphone with a script-writing pen. Both are dreams of Parker Pen Co. stylists, preparing for tomorrow’s brave new world . Anyone else misread the headline and get really interested? I think the automatic writing pen is like Homer’s robot, it looks cool, but is missing the stuff inside that makes it work. 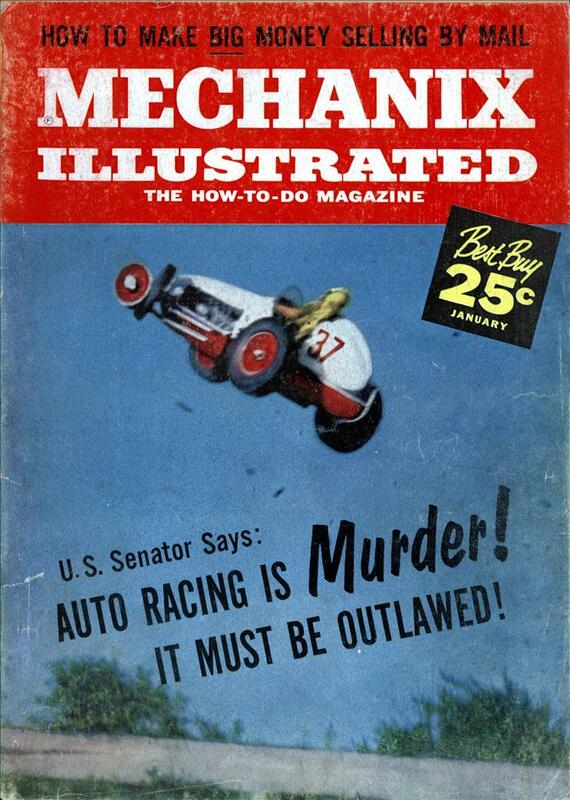 The autowriter is named “Parker 2000” – they’re behind schedule. Charlene may be on to something, the concept was also called “dictaphone” in the story. A little prurience could be good for business! When I was a boy my father was an executive for P&G and he took me on a tour of a plant in Cincinnati, They had a device exactly like the auto writer that they used to transmit orders and other info from one plant building to the other. It was not nearly as stylish but it sure impressed me. They let me write something with it and then showed me the output at the building across the street, which we got to via a tunnel under the road. I think the plant was called “Ivorydale” and yes , they made the soap there. It made quite an impression on my 8 year old mind. When I was a boy my father was an executive for P&G and he took me on a tour of a plant in Cincinnati, They had a device exactly like the auto writer that they used to transmit orders and other info from one plant building to the other. It was not nearly as stylish but it sure impressed me. They let me write something with it and then showed me the output at the building across the street, which we got to via a tunnel under the road. I think the plant was called “Ivorydale” and yes , they made the soap there. It made quite an impression on my 8 year old mind. Ah, wait I was confused, the device at P&G was an “automatic planograph” or something to that effect. Once more, if your post doesn’t show up either wait for Charlie and his minions to approve it or contact Charlie using the link provided. Don’t just type it in again. A few years later Parker did come up with an atomic powered pen. I’d rather have a talking paperclip that tried to guess what you wanted to write, and offer suggestions to help me move along. Good God, the nuclear pen had a isotope that would warm up the solid ink! They have printers that use wax cartridges still. But the thought of having a isotope so radioactive that it could would be palpably warm is really bizarre. I’m not familiar with isotopes, and the only ones I know that are warm put out a lot of unhealthy radiation and are pretty chemically toxic if ingested. the nuclear pen had a isotope that would warm up the solid ink! They have printers that use wax cartridges still. But the thought of having a isotope so radioactive that it could would be palpably warm is really bizarre. I’m not familiar with isotopes, and the only ones I know that are warm put out a lot of unhealthy radiation and are pretty chemically toxic if ingested.